There is a new tweak available in the Cydia Store. Just think, when you take advantage of the Cydia tweaks, you also increase the usage of your iDevice. These tweaks can add an amazing effect to your device and it can be shown to a lot a lot of people and it will also impress a lot of people. The new tweak available is called Unlock FX. It will add custom animation effects to your lockscreen. This tweak was developed by a developer named Filippo Bigarella. He has developed and created a lot of famous tweaks. 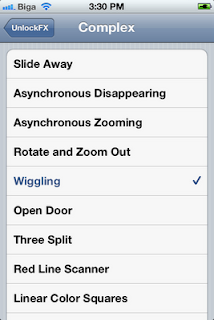 A couple of these tweaks are called Slideaway and Springtomizer2. This Springtomizer2 tweak lets the user change every effect found on your iPhone. This developer also created tweakweek. This is a Cydia tweak in which each developer involved with the development developed a Cydia tweak per day for 7 days. The tweak that we are discussing, UnlockFX adds amazing effects for the unlock animation. There are more than 30 effects in the settings and they can be set for the Unlock Screen. Some are directional effects and some are for more complicated. The directional effects include Rotate Clockwise and AntiClockwise. Some of the more complicated effects are slide away, rotate and zoom out. You can also set up a custom image. You can change the speed of the effect. This tweak is available for the iPhone, the iPad and the iPod Touch. Your device must be on iOS 5. This tweak is not free. It is available from the Cydia Store, and it is $1.99. So go ahead and get this even though it is not free. With the number of effects that are available, this is one that will be a lot of fun to get and play with. You will be pleased with the results that you get with this tweak. 0 Respones to "The Unlock FX Tweak"